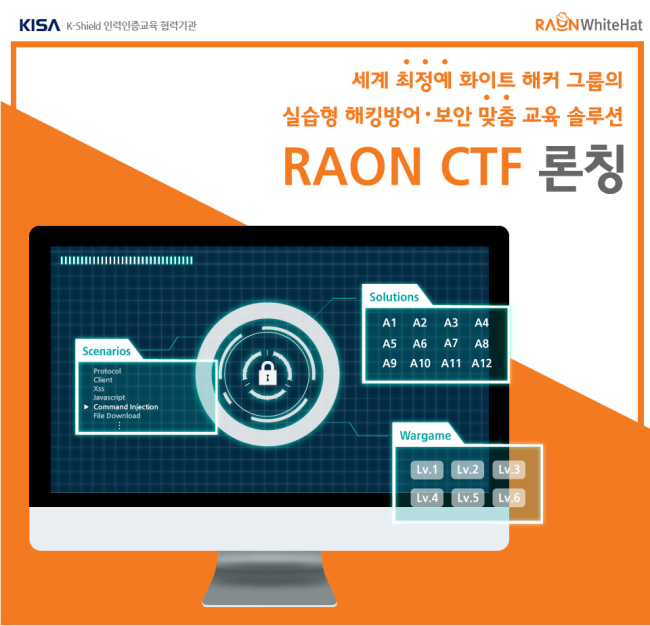 South Korean cybersecurity service provider Raonsecure has launched an education solution to help students hone skills to identify security flaws and defend against hacking attacks, according to the company Thursday. Dubbed Raon Capture the Flag, the education service consists of a curriculum inspired by a mock hacking test scheme. Raonsecure’s in-house white hat hacker center called Raon Whitehatcenter took part in developing the solution, according to Raonsecure. White hat hackers refer to ethical computer hackers that tests a website’s security. The solution offers students hands-on training experiences, so that they could prepare global information security capture the flag, or CTF, competitions. It is seeking clients from local universities or companies, including Chungbuk National University in North Chungcheong Province. Raon Whitehatcenter is a security intelligence service provider unit of Raonsecure. The center is made up of security experts who have won hacker competitions such as Defcon CTF in the United States, Secon CTF in Japan, Hitcon CTF in Taiwan and Codegate CTF in Korea.